What is the Standard-Sitemap Protocol? The Standard-Sitemap Protocol (SSP) revolutionizes the way we navigate the Web. The webmaster creates a sitemap file to represent the website’s structure. From this file, the browser builds a navigation system which replaces the traditional navigation bar embedded into the page. Navigation thereby becomes a function of the browser. Due to its platform independence, the Standard-Sitemap format is the future-proof norm for all of tomorrow’s devices. The protocol comprises an XML sitemap format and specializations of HTTP and HTML to link a sitemap to a site. What are the advantages of the Standard-Sitemap Protocol? No repeated re-orientation between different websites’ navigation styles. The navigation system is always in the same location and works the same way for all websites. No more hassle with intransparent navigation systems. Each user can customize the navigation system, according to their own needs (font size, appearance, etc.). Less learning effort for novices. Improved accessibility, since the sitemap expresses site structure independently of rendering style. Device-specific software is then free to render it optimized for that device. 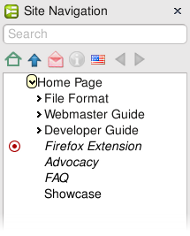 Unified form of displaying the site map itself (i.e. overview of all pages). Easy to implement a cross-platform navigation system. The designer can focus on each page’s actual content, as no regard to the navigation bar is necessary. Completely new opportunities are presented, since not only the page’s content, but also its position in the overall hierarchy, can be analyzed. What does an SSP sitemap look like? For web users, try our Firefox extension. For webmasters, take a look at the XML sitemap file format and some examples. Which websites is the Standard-Sitemap Protocol appropriate for? For each and every one — no matter whether it comprises just a handful of pages or several million. Can I contribute to the development? Get sitemap-generating software included in a popular CMS engine. Ideally, it should be one that already has a sitemap data structure, perhaps built-in, perhaps provided by a plugin but shared by other plugins that render it. If instead it has several plugins that do not share data, a user would have to provide that data before any sitemap would be deployed. It also helps if the CMS site has an auto-upgrade feature, so that the sitemap-generating software is automatically deployed. This will help to get sitemaps deployed on a large scale, which will encourage people to download sitemap-processing software, and encourage others to write software for other browsers. Write extensions for other browsers. Chrome, Safari and Opera all seem to be revealing their extension APIs, so they should be the ones to start with. Knowing that many browsers support sitemaps, webmasters will be encouraged to provide sitemaps of their own, not just rely on CMSes. Developers on other CMSes will want to take part too. Ensure that sitemap-fetching software knows how to handle cached sitemaps, conditional GETs and Last-Modified dates correctly. Sites with dynamic content may wish to provide correspondingly dynamic sitemaps. If you’re a developer of CMS software (especially WordPress) and want to help this project, please consider getting in touch via the mailing list.